Last week I received a lovely package from France. 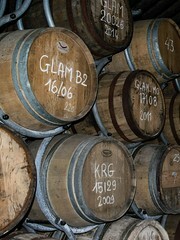 It was sent by Jean and Martine Donnay, owners of the Glann Ar Mor distillery in Brittany. I visited this small distillery last year with my family when we were on vacation in this beautifull part of France and I've been following their efforts eversince. The distillery produces two kinds of whisky, the peated Kornog and the unpeated Glann Ar Mor, and Martine was very kind to send me some samples from both series. Both Glann Ar Mor and Kornog are NAS whisky's. The ones I've tasted last year however do show a lot of quality and craftmanship. Natural colour and non chill filtering, this small distillery takes great care in their goal to create traditional single malt whisky, that's for sure! Today I'll be tasting the unpeated samples. Glann Ar Mor Bourbon Cask 46%, Glann Ar Mor Taol Esa-B2 Heiz Korn (Sauterne Cask) 46% and the very special Glann Ar Mor Maris Otter 15 Bourbon Cask 46%. Should be very interesting! 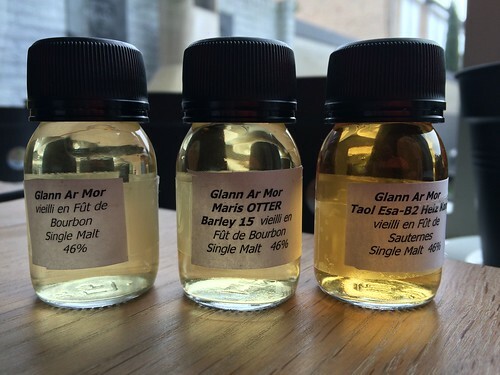 First in the line up is the "normal" Bourbon Cask matured Glann Ar Mor. A pale gold colour, it even looks a bit like a white wine. The nose is very fresh and fruity, a little hint of honey, a bit of marzipan but most of all sweet apples. Smooth, creamy mouthfeel. Again fresh, apple and sweet marzipan. No honey or vanilla here. There's not much woodinfluence but the basic spirit shows enough of it's beautifull character to make this a very nice whisky. Next up is the Maris Otter 15 Bourbon Cask. A slightly darker colour than the Bourbon Cask but still very pale. My guess is that both have matured for about the same period. I get the same fresh sensation in the nose but with different details. No honey here, no marzipan either. Tropical fruits, banana, peach and a little hint of apple. Smooth and creamy like the first sample. The taste of a tropical surpise. Very special if you know that the Maris Otter barley is a typical winterbarley. Again not much wood here and again the spirit keeps it's head up high! Beautiful single malt whisky. Last but not least is the Taol Esa-B2 Heiz Korn. This expression is matured on Sauterne Casks, casks previously used for maturing a a very sweet dessert wine. A very nice golden colour on this one indicates a different interaction with the wood compared to the first two samples. What a big difference with the first two samples. A mixture of sweet and sour. The wine influence is coming through in the nose of this one. The mouthfeel is very consistent throughout these samples. Good job! The Sauterne casks absolutely influenced the spirit here but not too much. Fresh and fruity? Yes but there's some spicyness here as well. Just a hint of liquorice. The Sauterne grapes cause a bit of a drying finish but I love it! Of course you can also check the official Glann Ar Mor website and if you ever get the chance... Visit the distillery as well!